You can move Peace Memorial Park and Miyajima in the shortest time at 45minutes. Depends on the tide level, the route may change to Motoyasu river route. However, the arrival time is the same. We offer you one-way ticket and round-trip ticket. One infant accompanied by one adult has no charge. Round-trip ticket is valid for 2 days. Handicapped passengers can get a discount. There's no discount tickets for group. What is different between cruising on sea and river. 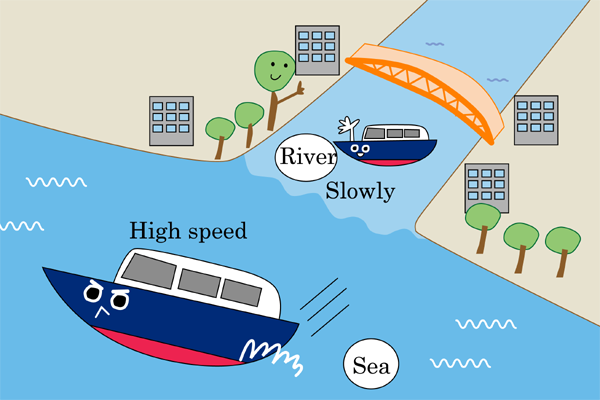 The ship goes through the river(Honkawa river /Motoyasu river) in the city,and then goes to the Hirosima Bay. The ship will move slowly while passing through the river. You will enjoy the view of the Hiroshima city on deck . When the ship come in the sea, it begin movement at high speed. You can move Peace Memorial Park and Miyajima in the shortest time.